Package details: 90 lenses in buffered saline with methyl ether cellulose. Material and % of content: 54% narafilcon A. 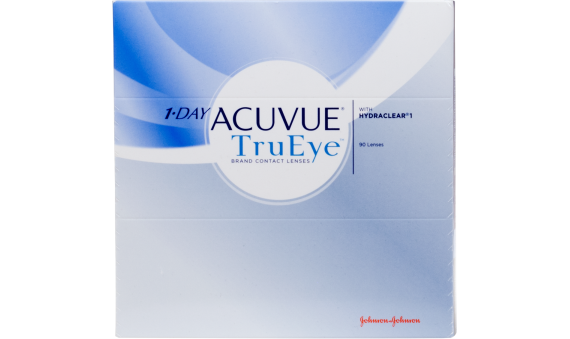 1-Day Acuvue TruEye contact lenses were designed to keep your eyes healthy and comfortable. They are made of silicone hydrogel, which lets in the oxygen your eyes need to breathe. 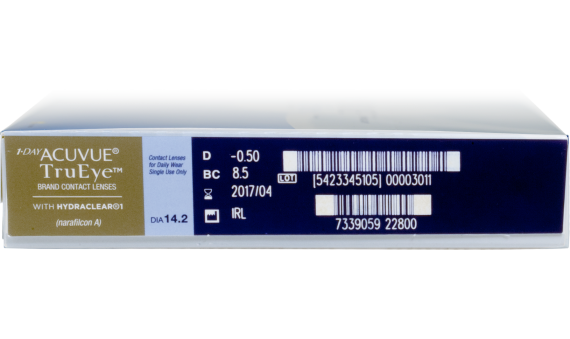 The HYDRACLEAR® 1 technology keeps these contacts ULTRA™ wet and smooth, so your eyes will still be comfortable at the end of the day. And best of all, you use a new pair of lenses each day. That makes 1-Day Acuvue TruEye contacts a hassle free, convenient option for the contact lens wearer who wants healthy eyes, but don't want to worry about cleaning and storing their contacts.